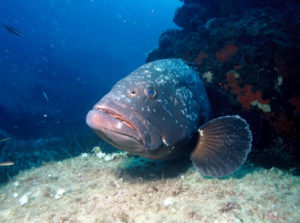 The name “grouper” isn’t so much a specific fish as it is a broader term for a species of fish called the Epinephelina, a subfamily that also includes a familiar name: the sea bass. The name “grouper” is believed to have originated in Portugal. Similar to several other types of fish, the grouper has a different name based on where it dwells. In Australia, for example, the fish is called a “groper” while the Philippines refers to it as the “lapu-lapu” or “pugapo”. Head over to the Middle East and the grouper’s name is actually “hammour”. As opposed to several other fish we’ve mentioned, the grouper isn’t known for being a fast swimmer. Instead, the fish is singled out by its huge mouth and a body that can weigh more than 200 pounds. Instead of biting its prey, the grouper will save some time and simply swallow its prey. This prey may consist of octopuses, fish, and crustaceans. Certain types of grouper will ambush prey using their camouflage ability while others will lead a more traditional predatory lifestyle.